The minimum number of words I need to write every day, beginning November 1st through the 30th. I am a masochist. 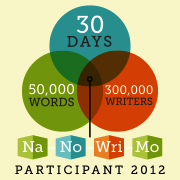 And I will produce a novel in 30 days, even if it kills me.